I don’t know why this felt so hard. I’ve been writing haiku every day for ten months now. And, you know, sharing them with the reading public. I think it was just that I was trying to do something really different from what I usually do — trying to be weird and experimental, just kind of throw stuff against the wall and see what stuck. And even though I told myself that this would be freeing and relaxing, I was surprised to find that I actually found it very stressful to try to come up with something Original and Interesting every day that I wasn’t incredibly embarrassed to let you guys see. Well, a lot of it I actually was incredibly embarrassed to let you guys see. This week may have started out the weirdest of all and then by the fifth day I was getting freaked out enough that I actually followed a couple of Michael Dylan Welch’s (excellent) NaHaiWriMo daily writing prompts, which until then I’d pretty much ignored in the spirit of experimental individualism. I just couldn’t take the pressure of marching to such a different drummer any more. So why do I care? I mean … no one scolded me for being too experimental this month, at least not out loud; people said nice things about the haiku they liked and politely kept their mouths shut about the ones that they didn’t. No one is ever mean to me on this blog. My readership didn’t go down, people didn’t unsubscribe. I still felt stupid and incompetent a lot of the time. Apparently I am way more insecure than I thought I was. This worries me a little, because it must mean that most of the time I am trying to write haiku that I think other people will approve of. Of course this isn’t entirely bad, the point of writing is supposed to be communication after all, so if no one understands or likes what you’re writing … well, you can either carry on in the same vein hoping that future generations will be more enlightened, or you can seriously consider the possibility that there’s something wrong with your writing. But if you’re spending so much time worrying about what other people think that you never actually figure out what you think yourself, that’s a problem too. Also, I think I freaked out a little at how good everyone else’s NaHaiWriMo stuff seemed to me. A lot of people seemed to take this exercise really seriously and put their best foot forward and come up with superlative work that really blew me away … and then there’s me, sitting in the corner tossing my word spaghetti at the wall, with a slightly village-idiot expression on my face. Anyway. (She said defensively.) Just so you know, I wrote a lot of other haiku this month that are a lot more, you know, normal. You’ll probably be seeing a fair number of them in the next couple of months. So don’t unsubscribe! The worst is over … and I will be discussing my inferiority complex with my imaginary therapist, so don’t worry about me. Everyone have a nice Valentine’s Day? Looking forward to warmer weather? (Or cooler, if you live in the Southern Hemisphere?) Great. Glad to hear it. Okay, got the chitchat out of the way. No time. Must be fast. Short. Abbreviated. Abridged. Yes, that’s it. This is the Reader’s Digest Condensed Books of haiku columns. Don’t let that put you off, though. It’s just my boring words that are abridged, not the haiku. I am giving pride of place this week to Amy Claire Rose Smith, the 13-year-old winner of the youth haiku contest at The Secret Lives of Poets. This haiku is not just “good for a thirteen-year-old.” I would be proud of having written it. Amy is the co-proprietor of The Spider Tribe Blog and Skimming the Water along with her mother, Claire Everett, also a fine haiku and tanka poet (I mean, she’s okay for a grownup, you know?) who has been featured in this space previously. At jornales, Alegria Imperial recently recounted a wonderful story (originally written for the Vancouver Haiku Group) about meeting a Japanese woman who critiqued her haiku in a way that seems to me very reminiscent of the way that Momoko critiques Abigail Freedman’s haiku in The Haiku Apprentice, something I wrote about not so long ago. The point of both Momoko and Mutsumi, Alegria’s mentor, is that haiku must come from the heart, must not just be a linguistic or intellectual exercise but must express something fundamental about what the poet is feeling. I think you should really go over and read the whole story yourself, but I’ll quote a few choice passages to give you an idea of what it’s all about. Mutsumi and I did meet over spare egg sandwiches and coconut muffins at the 411 Seniors Centre Cafeteria. … I laid the printed sheets out on the table, two pages of ten haiku. I had noticed her wince as she read them and then, she pushed the pages away. We plumbed the idea deeper. She focused on my delight to see the moon. What did I want to do about it? And how would I have wanted to reach the moon. I said the only I could would be “to fly”. She began to smile and latched on to the image, to the idea of flying. She asked how I would have wanted to fly. And I said with wings, of course. “But you can’t have wings. Still you can fly with your thoughts, your thoughts of happiness,” she said. “Think of where these come from,” she urged me on. First of all, I’ll mention right off the bat that there was an essay by Randy Brooks called “Where Do Haiku Come From?” that I am going to have to write a separate post about because I can’t do it justice here. So remind me about that if I haven’t come through in, say, a couple of months. There were also a couple of interesting and related essays by Ruth Yarrow and David Grayson about bringing current events and economic realities into the writing of haiku. Ruth wrote about the recent/current financial crisis and David about homelessness. Both discussed the importance of not neglecting this aspect of our reality when we look for haiku material; David also discussed how to avoid the pitfalls of sentimentality and cliche when dealing with topics that start out with such strong emotional associations. I tend to think that the reality of the urban environment and the modern political and economic climate are seriously neglected in haiku (and I am as guilty as anyone else of neglecting them), so I was happy to see these essays here. Little Changes, by Peter Newton; The First Cold Nights, by Theresa Williams; Not Amused, by Ray Rasmussen; Marry Me, by Genie Nakano; Gail, by Lynn Edge; This Strange Summer, by Aurora Antonovic; Home, by John Stevenson; Looking Back, by Roberta Beary; Koln, by David Grayson. Done! Okay, for me, that really wasn’t bad. Just wanted to say that I will probably not have another Haikuverse update for at least 3 weeks, possibly 4, since in March I will be contending vigorously with midterms, family visits, a new job, and oh, yeah, this haijinx column gig. (Send me news!) I’ll miss droning endlessly on at you guys but at least this will give you a chance to catch up with all the old columns. haijinx welcomes Melissa Allen as our newest regular columnist. haijinx publishes around the solstices and equinoxes each year. The first 2011 issue will be released on March 20th and the submission deadline for Melissa’s a jumble of flowers is March 8th. All other submissions are due by March 1st. For more information, please visit our submissions page. Me again: If any of you don’t know about haijinx, it will be well worth your time to go check it out. I mean now — don’t wait until my column appears, for goodness’ sake. It’s a great journal with a focus on humor in haiku, recently revived after a several-year furlough by its founder and editor, Mark Brooks, and staffed by an impressive roster of poets including Mark, Carmen Sterba, Alan Summers, Roberta Beary, Tom Clausen, Richard Krawiec … I’m a little awed and humbled by being included in their company. Also, that thing about sending me news? Yeah, we mean it. Conferences? Events? Contests? Publications? New (or old) exciting blogs or websites? Anything? Anything? Shoot it to the email address above. Otherwise I’m going to have to comb the Web myself looking for news and you never know, I might miss you. So brag yourself up. 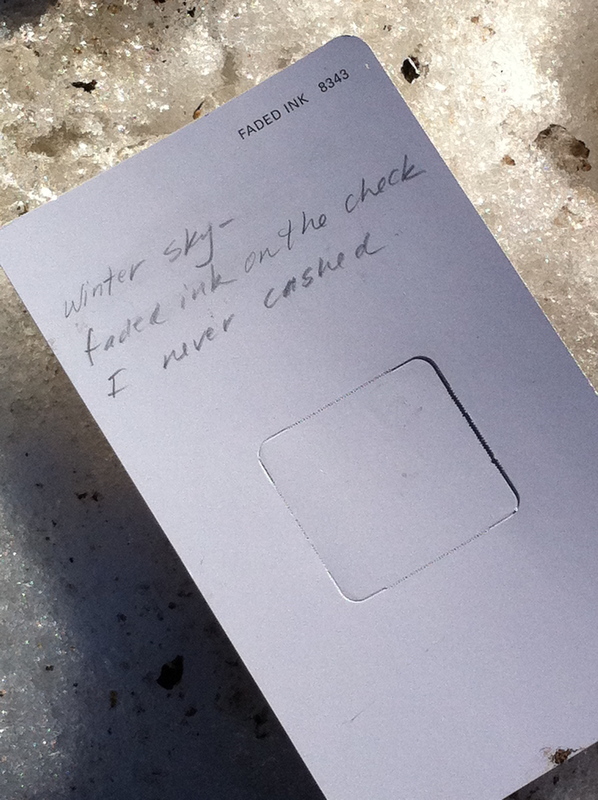 First posted at Haiku Bandit Society for the Feb. 2011 Moon Viewing Party. Willie Sorlien, owner and proprietor over at Haiku Bandit Society, linked the last line to a great Traffic video. Go watch it, it’s pretty much in the spirit of the haiku, and the video has cool images of its own. Week One is here. Week Two is here. Am I getting any better? … Never mind, I don’t want to know. What is this thing again? (I hear you thinking.) Oh yeah … it’s a paint chip.